Returned home from the Sianwood Stud in Wales where he has bred some exceptional foals for the past three seasons. 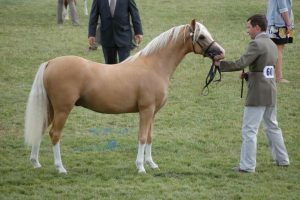 He has been lightly shown as a two year old when he was a WPCS Medal winner and 2nd at the Royal Welsh Show (photograph). He is full brother to a host of top class ponies including the 2017 Royal Welsh Section B Champion, Waxwing Penny Gold, and Waxwing Penny Farthing, 2nd M&M Junior Ridden at Horse of the Year Show.